For most Americans, complaining about the quality of their drinking water is like Bill Gates complaining about the quality of leather seats on his private jet -- you've got it better than most, so shut up. But while our water is an infinite upgrade from untreated sewage, it's certainly not perfect, and not just in national-news-making situations like the tragedy in Flint, Michigan. In fact, it can be dangerous; a new study from the Environmental Working Group (EWG) found alarming levels of chromium-6 (the carcinogenic "Erin Brockovich" chemical) in drinking water that nearly 200 million Americans drink, from all 50 states. Chromium-6 is far from the only water pollutant. Our water can contain varying levels of other contaminants such as arsenic, lead, and mercury. What are you supposed to do? You know drinking water is an essential healthy habit, linked to everything from losing weight to helping fatigue. So you need a lot of it, but getting the best stuff might not be as simple as buying the fanciest-looking bottle at the grocery store. For starters, bottled water isn't necessarily any better for you, and it comes at a steep financial and environmental cost -- Americans spent $11.8 billion on bottled water in 2012, and throw away more than 60 million of those plastic bottles a day. 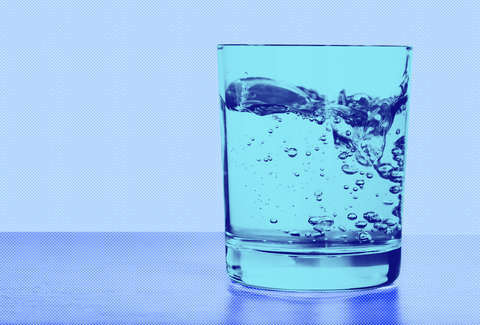 So what's the best way to ensure you're drinking the healthiest water possible? Most contaminants, like chromium-6, hit the water supply as waste products from manufacturing or agriculture, which is why some areas may have more contaminated water than others. Flint, for example, had decade upon decade of auto-industry sludge leaking into its river -- and that doesn't even account for the old pipes transporting it to residents' faucets! "One of the most important ways to get the cleanest tap water is to ensure that the source water, upstream from the water utility, is not being contaminated by agricultural waste, industrial pollution, or human activity," says David Andrews, PhD and EWG senior scientist. It's important to stay on top of your city's contamination levels, and which chemicals and other toxicants you have to worry about -- you can do this by calling up your local water authority (it IS public information, after all, as long as you're prepared to wait for typical bureaucratic delays), or you can check out the results of the EWG's independent testing. Fresh stream water squeezed from volcanic ash in a South Pacific archipelago untouched by humans for thousands of years before the bottling company arrived sure sounds like it would be the cleanest, best option, but in reality, bottled water is sometimes just filtered tap water dressed up in a fancier outfit. It's also not as closely monitored as the stuff coming from your sink. Bottled water is regulated by the FDA, which doesn't require water bottle manufacturers to disclose lab testing -- the EWG found 38 contaminants in 10 popular brands. Drinking water, on the other hand, is monitored by the EPA, which has regulations for more than 90 contaminants in drinking water, and must adhere to clean water standards under the Safe Drinking Water Act. Not surprisingly, the EWG recommends filtered tap over bottled water, which you can do yourself. The trick most popular bottled water companies pull is that they're doing exactly that, and selling it to you at a huge markup. So if your bottle says something like, "Filtered water," "Purified water," or "Treated water," and includes some hype about state-of-the-art filtration technologies, what you're drinking is the filtered tap water of a huge bottling facility. So you know filtered water is the best option, but not all water filters are created equal. Some are used mostly to get rid of chlorine and zinc to make tap water smell and taste better, but not necessarily any other harmful chemicals. Make sure you pick a water pitcher or filtration system that removes the most harmful contaminants; the EWG has a handy guide here. "In your home, an inexpensive carbon filter built into a water pitcher or installed under your sink will remove or reduce a wide range of common water contaminants," Andrews says. "Before you purchase a water filter, you should always verify what pollutants are removed." This makes a whole lot more sense to do once you already have a list of the contaminants in your particular supply -- how can you buy a filter if you don't know what you're filtering? Whatever you choose, make sure you change it out regularly; old filters can harbor bacteria, and won't work as effectively. By now, you're well aware of the dangers caused by bisphenol A (BPA), a carcinogen that mimics estrogen, is an endocrine disruptor, and is found in lots of hard plastics (plastic #7). You're not? What's wrong with you?! All that synthetic estrogen must have gone to your head. BPA can screw with your hormones, and it can also leach out of plastic into your water. You don't want that. If you decide to use a filtered pitcher system, make sure the plastic pitcher is BPA-free, although in an ideal world, you'd steer clear of plastic container altogether -- it turns out that the replacements for BPA aren't any better, and might be even worse when it comes to your endocrine system. Also, don't reuse plastic water bottles; not only can they contain bacteria, but other plastic chemicals can be broken down and released in the water the more they're refilled. This makes plastic bottles an unsustainable water choice no matter how you slice it -- either you're tossing away tons of plastic and money, or you're sucking down chemicals in that gnarly old bottle. Your best bet is to go with a glass or stainless-steel vessel, probably the latter if you tend to play rough with your bottle. If reverse osmosis sounds super high-tech, it's because it is. The complex filtration systems ensure that water goes through a five- or six-step process before it hits your lips, which puts your puny little pitcher filter to shame. It's expensive, no doubt -- a few hundred dollars at the bare minimum -- but installing and using a reverse osmosis system will give you the best water. "A reverse-osmosis filter system that includes carbon filtration will give you the cleanest water possible at home and will reduce or remove most water contaminants including arsenic, hexavalent chromium, and perchlorate," Andrews adds. So, to get the best, cleanest drinking water, you need to install a reverse-osmosis system, and drink solely out of glass or stainless-steel containers. Your next best option is a carbon filtration system that goes over your faucet -- it's significantly cheaper, and easier to use. Bottom line: Don't drink bottled water, don't drink out of hard plastic, and don't drink plain tap water. Follow these rules, and you can drink that whole gallon of water a day without fear. Christina Stiehl is a Health and fitness staff writer for Thrillist. Her plastic filtered water pitcher probably doesn't cut it. Follow her on Twitter @ChristinaStiehl.